Heat the butter in a large sauté pan and cook the livers and garlic with the rosemary sprig for 5-8 minutes, stirring occasionally, until the livers are cooked but slightly pink in the centre. Leave to cool for 5 minutes, then discard the rosemary. Place the warm livers in a food processor and blend until smooth. With the motor running, pour in the cream, followed by the wine, and process until well blended and completely smooth. Season to taste, then spoon into a shallow serving dish or 4 x 100ml ramekins. Cover and leave in the fridge for about 1 hour until firmly set. To make the crostini, brush a little olive oil over both sides of each slice of bread and place under a hot grill, lightly toasting each side for 1-2 minutes. 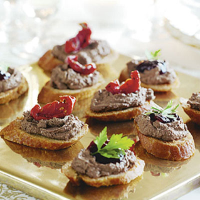 To make the canapés, spread the pâté on the crostini and top with a selection of garnishes, such as sliced sunblush tomatoes, sliced black olives or a sprig of flat-leaf parsley. Alternatively, serve the pâté in its dish or ramekins. You can make the pâté a couple of days in advance. Cover and keep chilled in the fridge. If serving whole, top the pâté with clarified butter. Gently warm 75g butter in a small pan until just melted. Gently pour the liquid over the surface of the pâté, leaving the solids behind. Drop in some peppercorns, a bay leaf and a few rosemary sprigs, and leave to set. Try with a glass of Pinot Gris.